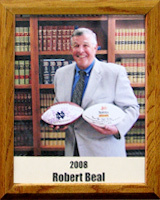 Robert Beal was a football official for 35 years, beginning in 1970 for high school and youth games and going all the way to the Pac-10 as referee and head linesman for 27 years. He was on the officiating crews for 14 bowl games, including the 1987 Fiesta Bowl, 1989 Rose Bowl and 2005 Fiesta Bowl. He also worked games in the Western Athletic Conference and the Big Sky Conference. He represented Pac-10 officials with interaction with the Pac-10 Conference and its football officiating committee. He helped develop a rating system to improve official’s accountability. On March 5, 2006, Robert received a plaque for “Outstanding Contribution to Amateur Football” from the National Football Foundation and College Hall of Fame – Southern Arizona Chapter. Robert played varsity football at the University of Arizona (1964-65) and earned the nickname “Mad Dog” for a play during a game vs. BYU. He received the Bear Down trophy from teammates in 1965 as the team’s most inspirational player. Beal was also an honorable mention to the Associated Press Academic All-America team in 1964-65. He is a board member of the Tucson County Club and is active in charitable organizations.